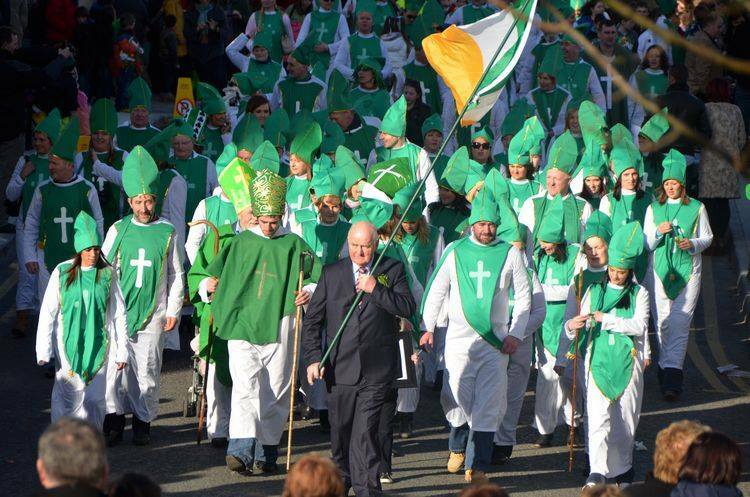 Ardara welcomed St. Patrick on Sunday last, and a large crowd turned out to see the large array of floats and marching bands that graced the Front St.
On what was a beautiful day, the large crowds enjoyed the spectacle and cacophany of sound that immersed the town. In all there were 6 Marching Bands and 12 Floats that contributed to one of the best ever parades in the Town. The Parade was led by this years Grand Marshall Tomas Boyle, who has been involved in business for many years, and also has a strong association with the local GAA. Tony Breslin was an excellent St. Patrick, a very popular choice indeed. The Band winners were Killaghtee, with the Youth winners going to Donegal Town. There was also a good selection of Floats, with the Float winners being the Point Men, with Whatacollums in second place, and Maloneys in 3rd. The best Window award went to Kennedys which was superb. A great thanks to Margaret Boyle, who was the main organiser, for all her great work. She was ably assisted by Majella & Hugh P. Shovlin. Thanks also to the Gardai, Tony Gallagher and his stewards, for all their help in making sure that everything ran smoothly. To all the entertainers Niamh Breslin and John J. McBrearty, the Cunningham/McNelis School of Dancing and the Ardara Line Dancers led by Bridget Robins. Great thanks to Donegal Creameries and Francis Gallagehr for the use of the lorry, also to Frank McGhee for the PA, and who was ably assisted by Eamon Boyle and PJ McCafferty. To all the judges: Floats: Emma Kennedy, Jack Maguire and Terence Boyle, Bands: Dessie Coyle. The committee would like also to thanks the Bucket Collectors and those who contributed. All funds raised will go to the future hosting of the Parade. Check out the link below to see if you can find anyone you know on the day!